You will be able to Learn PUBG Mobile Hidden Features, Tips and Tricks to Get Defiantly Chicken Dinner. Today we are here with Detail guide on PUBG Mobile. PUBG Mobile isn’t a game that’s easy in any way. There are a lot of players, and if you’re relatively a beginner at PUBG Mobile or battle-royale games in general, we have some great tips and tricks to help you score that chicken dinner. Adjust the graphics quality according to your phone’s capabilities. PUBG Mobile does this automatically, but if you feel like your game is lagging or dropping frames, you can lower it further, and vice-versa. A higher graphics quality setting will definitely make it easier to spot other enemies, but if your phone starts lagging or dropping frame, make the trade-off and opt for a higher frame-rate instead. In Settings -> Basic, enable the ‘left-side fire’ button to easily shoot with the left hand while aiming with the right. This is very handy in scoped shots. Without the left-side fire button, you’ll find yourself aiming and shooting with the same hand, which, believe me, is really difficult. Check that ‘Aim Assist’ is turned on for easier aiming. Aim assist is required on a touchscreen phone (usually) because aiming at a touchscreen isn’t nearly as accurate as aiming with a mouse is. A spot-on aim will help you take out enemies quicker and will also help in close-quarter-gunfights. Also inside Settings -> Basic enable ‘Auto open doors’ to quickly get inside buildings without having to constantly tap the door button. Do note that you’ll have to tap the button to close the door. In Settings -> Graphics, you can also turn on ‘Auto adjust graphics’ to ensure a consistent frame-rate while playing. This basically means that if your phone starts over-heating, or if the battery gets low, PUBG Mobile will automatically adjust the graphics quality to compensate for it. Head over to Settings -> Controls -> Customize, and adjust the size and position of controls according to your needs. For example, I’ve made the grenade button a little larger to make it easier to tap, and I’ve shifted the left side fire button to where my left-thumb naturally lands, so I can shoot even faster. As you scour the battlefield for equipment, you’ll notice a plethora of accessories such as magazine extensions and muzzle attachments that you can use to augment your guns. Pay close attention to these, as they grant certain bonuses like recoil reduction, faster reloads, and extra ammo capacity. Be careful though, as many accessories can only be used with specific guns. For instance, if you’re armed with an HK416, you’ll need AR-specific accessories. So magazine extensions made for an AKM will not work for your weapon. Whether you like playing in Miramar, or whether you like the foliage in Erangel, if you really want to be a good player, use the map well. The map is updated with new safe-zones, and red-zones, so keeping a close eye on the map can be helpful. The map in PUBG Mobile also shows the direction of gunfire, footsteps, and vehicles which can help you get to know where enemies are, and if they’re coming towards you. One great aspect of PUBG is its totally adjustable controller layout, which allows you to place commands exactly where you need them to be, in addition to its more general aiming and movement settings. To set this up, go to the “Controls” menu from the game’s home screen and choose a movement layout, then tap on “Customize” to go to the layout page for your touchscreen controls. You’re free to drag each command to your preferred location from there. Just be sure to hit “Save” once you’re done to keep the settings. Unless you’re playing with your friends, the squad mode will often pair you up with people where at least one of them is an annoying prick constantly singing and screaming into their mic. With the latest PUBG Mobile update, you can mute individual team-mates by tapping on the speaker icon. This will open up a menu with all your team-mates’ names on it, simply tap on the speaker icon next to the team-mate you want to mute and that’s it. Now focus on the game. This is the biggest mistake that one does while playing PUBG Mobile. Shooting at someone who is not in your range will not only jeopardize your position but will also let other players know that someone is close by. This means that your chances at having that Chicken Dinner will decline. Most shooter games, be it CS: GO, Fortnite, or PUBG make use of directional audio that you can leverage to be more aware of your enemies’ locations. While the stereo-front-firing speakers on your phone may be good enough, put on a pair of headphones. This will help you in not only hearing distant gunfire, but also footsteps of an approaching enemy so you’re not taken by surprise. It might not sound like much, but it makes a pretty big difference. Whether its one-on-one engagements or full-on battles involving numerous combatants, firefights are inevitable and the key to what makes PUBG so addicting. These encounters always seem to come out of nowhere and blindside you, which can cause you to panic and fire aimlessly. But chances are, your enemies are just as excited, so take your time and aim as you engage your opponents. It’s also important that you move around to make yourself a harder target to hit. While doing so, aim at your adversary’s center mass — avoid headshots altogether. Doing so ensures that follow up shots that tend to kick up find their mark, and it reduces the need to readjust your aim with each pull of the trigger. You can hide behind corners and use the ‘eye-button’ to look around the corner without exposing yourself. This is a handy trick that can help you spot enemies without letting them spot you. Besides constant movement, we also recommend crouching or going prone while in the midst of a shootout. Not only does it make your shots more accurate, it also forces your opponent to readjust his aim as you make yourself a smaller target. One of the most appealing aspects of PUBG is the vast arsenal of real-world weaponry that you can use to dispatch your foes. The selection found in the game is astounding, ranging from popular pistols like the venerable 1911 and Glock 17, to SMGs and assault rifles like the UZI and M4A1, all the way up to classic bolt actions and sniper rifles such as the Karabiner 98K and AWM. Safe zones within PUBG shrink over time to dissuade players from staying in one place. This is absolutely necessary for the game because of the sheer size of its maps, in addition to the number of players competing to win. A shrinking battle zone not only eliminates stragglers but forces players to concentrate in a smaller area and ensure a fierce, exciting battle to the last man. With that in mind, it’s a good rule of thumb to land as far inland as possible. Placing yourself around the center of the safe zone gives you significantly more time to scrounge for gear. You’ll also get a chance to set up shop and wait for rival players to come to you. With up to 99 other players to contend with, chasing an ever-shrinking safe zone should be the least of your concerns. Energy drinks and painkillers auto-heal you for a duration of time, and also give you a speed boost, so use them often and as needed. Most healing equipment like bandages and health packs won’t heal you past 75%. Only the med-kit can heal you up to 100% and that’s very rare. Energy drinks and painkillers take their time to heal you, but they’ll take you up to 100% so make sure you use them often. When playing team-based matches, you have a higher chance of knocking down your opponent, barring a headshot. Whenever you incapacitate an enemy, be sure to check your surroundings for lingering teammates or other combatants. Remember, guns make loud noises and will attract other players to your location. Finish off your enemy only after determining the area is clear. Sitting in the co-driver seat of a vehicle keeps it off, allowing you to hide inside without alerting other players to your presence. They’ll still be able to see you, but unless you parked your vehicle in the middle of the desert, there’s no reason for most players to suspect that a player may be sitting inside a vehicle and not driving it. Upon jumping off the plane, it’s very important that you descend as fast as humanly possible and beat your opponents to the ground. This extra time allows you to hit the ground running and scavenge for weaponry and gear. Push all the way forward on your movement stick while in midair to enter into a steep dive, and don’t even bother with the parachute button, as it will automatically deploy when it absolutely has to. 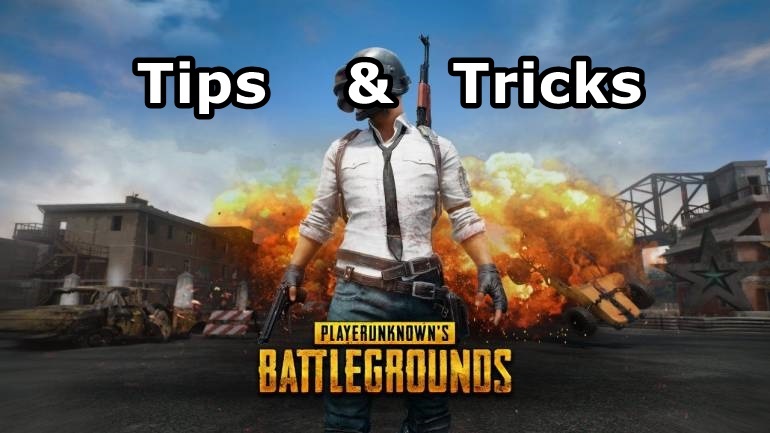 I hope you understand all tutorial on PUBG Mobile Hidden Features, Tips and Tricks. If you have any problem then ask in the comment box. We can solve your problem.